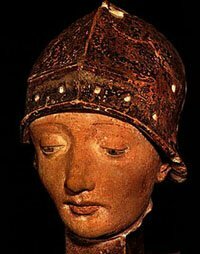 Joan of Arc had a great faith in God. She believed she had been chosen to lead the army of France in battles with England. She carried a banner onto the battlefield, but no weapon. She didn't want to hurt anyone. The English soldiers were afraid of her because they felt she had supernatural* power. Her father wanted her to get married, but she said she wanted to follow God's calling. She didn't want to marry - and she didn't. During the battle at Orleans, she was struck by an arrow. She pulled the arrow out and continued to lead. News of her courage began to be told, and sometimes people would just give up rather than face her in battle. She dressed in men's clothing and cut her hair short so she would not be recognized on the open roads. Once, when she was imprisoned, she threw herself out of a prison tower. She fell 70 feet to the ground, but she didn't die. They put her back in prison and then in a few months she was put on trial. They said she was guilty of witchcraft* and of wearing men's clothes. She died as a martyr. * She was burned to death. Later there was another trial and they said she was not guilty, but that she was innocent. * She has even been declared a saint* by the Roman Catholic church. There is disagreement about her education. Some people say she never did learn to read nor write, but you can look at copies of letters that others say were written by her. 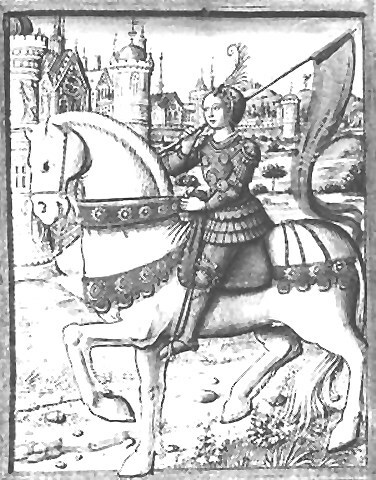 from "300 Women Who Changed the World"
At biography.com search for Joan of Arc. "The Life of Joan of Arc"
Joan in my eyes was the peak of what a woman could be. Women in this day and age think they are independent.. look at joan she did it 500+ years ago not only was she independent she was a great leader as well. I have much respect for her and what she did. May she and her deeds always be remembered. I never realised how awesome Joan of Arc was! I definatley want to have Joan for my confirmation name! 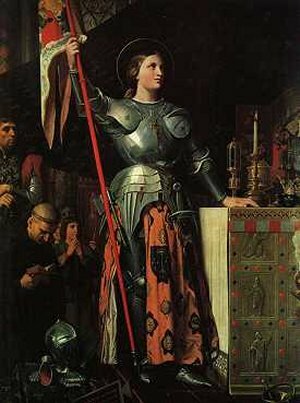 Joan of Arc is actually a saint! I just learned that, and I'm using her for my Confirmation name. She is such an incredible woman!! Hi I'm doing history fair this year and I am having a great time on this site. Doesn't Joan of Arc ROCK!!! 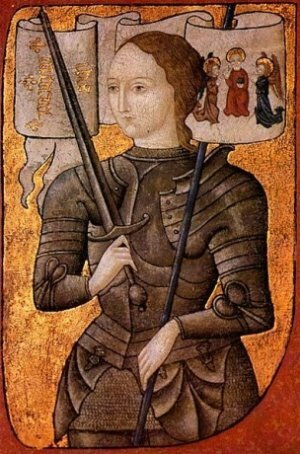 I had to do a report on joan of arc.this site helped me to relize how amazing and inspiring she acually was!!!!!! This page displayed 205,419 times.